Ever since I was very young, I have adored all things salt and vinegar. So when I came across the original version of this recipe at Umami Girl, I was extremely excited to give it a try. I altered her version a bit, just used a LOT less oil, so that they would be less Weight Watchers Points. OMG, they were so good! They do have a very strong taste of vinegar, so if you want a more mild taste, boil the potatoes in half vinegar, half water. I prefer the strong vinegar taste, so I boiled them in just the vinegar. They taste identical to salt and vinegar potato chips, and come out to just 2 Points per serving. I made these as a side dish to my Crock Pot Beer Chicken, and it was a perfect meal. These Roasted Salt and Vinegar Potatoes will definitely be made again. Enjoy! What a delicious and unique potatoes recipe that tastes great and doesn’t use up a lot of Weight Watchers Points. 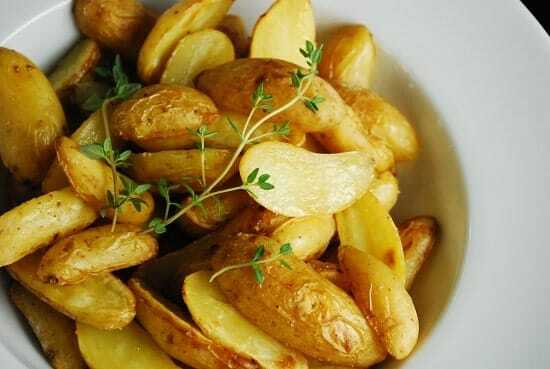 These easy Roasted Salt and Vinegar Potatoes are the perfect low calorie side dish that is flavorful and satisfying. Preheat oven or toaster oven to 400 degrees. In a small pot, combine the potato slices and vinegar. Bring to a boil, then lower the heat and simmer until fork-tender, about 8 minutes. Let cool in liquid for 30 minutes. Then drain well. Dump the potato slices onto a sheet pan, spritz lightly with an olive oil mister, then sprinkle with salt and pepper, and toss to coat. Arrange the potato slices in a single layer. Roast until lightly browned, about 25-30 minutes. Then flip the slices and broil until the underside is lightly browned, about 5 minutes more. Serve warm. I made these last night and really liked them, although hubby thought they were too sour. I’m going to try them again and dilute the vinegar with some water and see if he approves. I love the idea and want to be able to make them for both of us! Thanks for a great recipe! How clever boiling the potatoes in vinegar! I bet the flavour gets right in there. Maybe I’ll make these over the weekend. Had these last night and they were DELICIOUS! Making more for tonight! I’m confused on the servings. It says yield is 3 servings, but below that it says entire recipe is for 4 servings. Can you clarify? Thanks. I love every one of your recipes that I’ve tried. You are so creative with healthy dishes. I’m with you I love all things Salt and Vinegar! How do you think this would work if I tried it with chicken wings? I have been trying forever to reproduce the Salt and Vinegar wings from Buffalo Wild Wings. I would steam the wings in the vinegar rather than boil. Guess I gotta try! Thanks for all the great recipes! This isn’t a low carb site.